By now, you are probably aware that I am a bit of a math geek. I love math, and I love reviewing math apps. As someone who used to teach math from Grade 7 to 12, I am always intrigued to learn how other people would approach different math topics. Today, I am sharing a relatively new app from Lisbon Labs that tries to introduce a range of basic math concepts through 30 mini games. Called Math Superheroes, the app makes a perfect learning companion for juniors ages three to seven. Math Superheroes offers 30 mini games to practice math concepts. Math is My Super Power! Math Superheroes contain six chapters that cover a range of topics, including recognizing numbers, counting, basic math operations, patterns, sequences, and shapes. Each chapter contains five educational games to teach juniors a specific topic. Designed to look like a book, you can switch from one chapter by turning the page. Instead of detailing each of the 30 games, I will briefly discuss what juniors can learn from each chapter. In the first chapter, Understanding Numbers, juniors will learn to recognise the number 1 to 10 and their word representations, i.e. one to ten. The app uses creative gameplays such as asking players to put back together 2-piece number puzzles or to sort robots according to their numbers. And if your juniors are already familiar with the number sequence from 1 to 40, they can enjoy a connect-the-dots game at the end of this chapter. Counting is the title of the second chapter. Here, juniors will learn basic counting skills, a little bit of addition, and spotting the required number of objects. They also will learn to use other numeric representations, such as tallies and domino tiles. In the next chapter, Ordering, Patterns & Sequences, juniors will learn about arithmetic number sequences and sequences involving lines and shapes. 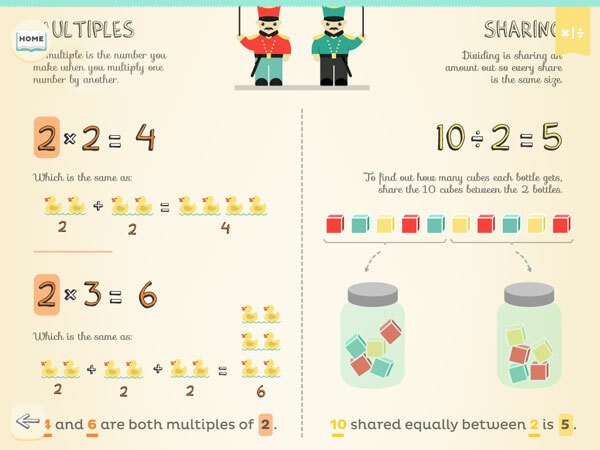 The subsequent two chapters, Adding & Subtracting and Multiplying & Dividing, bring 10 beautifully illustrated games to practice these basic math operations. The final chapter, Shapes & Symmetry, introduces geometry concepts such as shape matching using jigsaw puzzle, symmetry and mirroring, and deconstructing 3D objects into their corresponding 2D plans. Math Superheroes is not a math workbook app filled with randomly generated problems. Instead, it is an app that helps juniors to understand various math concepts by offering new and creative ways to explain them. It is also a great app for parents, because the developers have included special Learning sections that contain beautiful infographics to help you visually explain each chapter to your juniors. Some of them are really good that I am tempted to print them — if only the developers would release them in printable PDF format. Usually I would recommend parents to accompany their juniors when they play a new app for the first time. With up to 30 games to play, it would take a while to do this. Fortunately, the developers have included an audiovisual tutorial for playing each game. Match the 3D shapes with their corresponding 2D plans. As you have probably noticed in the screenshots, Math Superheroes is a beautiful app. The beautiful infographics especially impressed me. I also like the way the entire app is designed under a single cohesive theme: robots and aliens. I believe it is not a trivial thing to design 30 different games with a single theme. And finally, there are at least eight games that I really like in this app because of their originality. They are also simple and appropriate for the app’s target audience. My only wish is for the developers to update the games such that they are randomly generated each time. Parents can access the special Learning section to get helpful infographics. Math Superheroes is a beautiful app that can help your juniors learn math concepts visually using creative games. Combined with the beautiful infographics in the Learning section, this app is a great learning resource for juniors ages three to seven, even when they seem to already be familiar with these concepts. Count, Sort and Match. Develop basic math skills through colorful mini games. Mathlandia. Learn to count with the help of cute alien buddies. Bugs and Numbers. Beautiful math app lets juniors play and learn with colorful insects.